Early in-crop weed control will yield more than late control almost all the time. (This article lists the few exceptions.) Erring on the early side is the safest economic approach and then, if necessary, spray a second time. In terms of cash costs, early spraying costs the same as late spraying, assuming rates and tank mixes are the same, but the yield benefit of early spraying can make a big difference to the return on that herbicide investment. Early weed control is the economic winner. Studies behind this early-spraying recommendation. 1. AAFC summarized nine site-years of spray timings of Roundup Ready canola at Lacombe, Beaverlodge and Edmonton, Alberta. Glyphosate was applied at the 1- to 2-leaf stage, 3- to 4-leaf stage and 5- to 6-leaf stage of the crop. 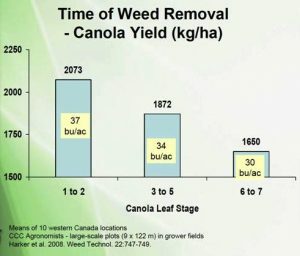 In seven out of nine cases, early timings (1- to 4-leaf stage) resulted in the highest canola yields of all treatments. 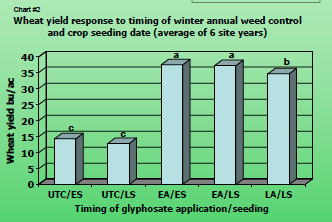 At Lacombe and at Edmonton sites in 1999, the latest applications yielded better because a significant number of weeds emerged after the early and mid glyphosate application. In this situation a second application of glyphosate would have been a good strategy two times out of nine. 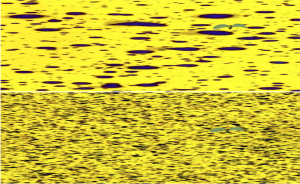 Read the study “Field-scale time of weed removal in canola” by Harker, O’Donovan, Clayton and Mayko. As a result of this research, AAFC weed scientists Neil Harker and John O’Donovan estimated that the yield effect of one weed emerging a week before the crop is equivalent to that of 100 weeds emerging three weeks after the crop. 2. Research by applied research associations in Alberta with seven farm field trials across the province found that waiting for late weeds to germinate did not pay. Their results showed a 224 kg/ha (4 bu/ac) yield increase by spraying at the 1-leaf versus the 5-leaf stage. 3. 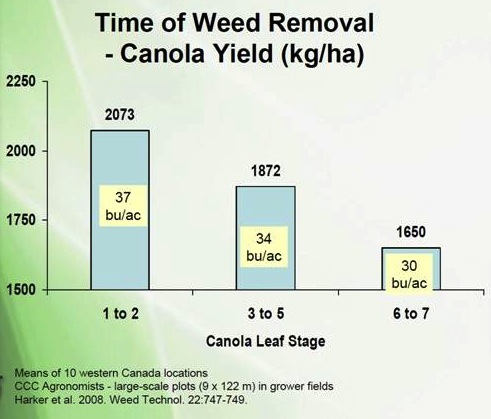 In trials conducted by the University of Manitoba at multiple locations in 1998 and 1999, it was necessary to control weeds by the 4-leaf stage to prevent greater than 10% yield loss. The study. The clear message here is that even if a later application can remove all the weeds, the yield loss from that early competition cannot be recovered. One of our Alberta agronomy specialists encountered the situation in the photo. Canola emergence was patchy in this small area, but generally good overall. The bigger issue was the big population of tiny weeds. 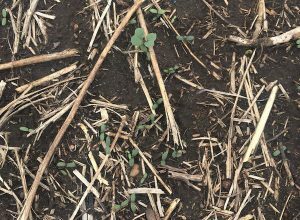 The agronomy specialist wondered if these buckwheat seedlings, though very abundant, were too small to spray? The answer is no. Broadleaf weeds sprayed at the cotyledon stage with canola herbicides (Liberty, Roundup and the Clearfield products) should be well controlled. The key is to have coverage. Large droplets and low water volumes could mean some small weeds do not get a spray droplet. 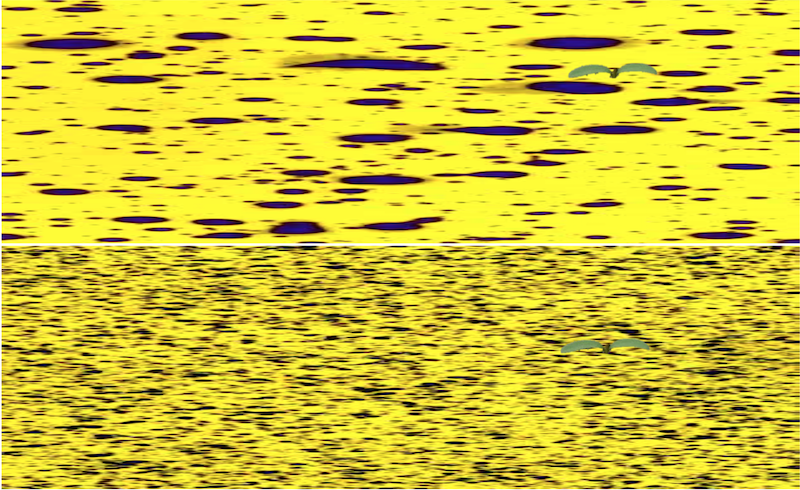 When using coarse sprays, recommended to reduce drift, also use higher water volumes to improve coverage. Grassy weeds such as wild oats may not be controlled as well at the coleoptile stage because the largely inert coleoptile will protect the true leaves from exposure to the herbicide. The other challenge is that wild oats’ natural leaf surface, which is hard to wet, makes deposition of a herbicide on the leaf surface difficult. (See page 107 here.) If the only weeds are grassy weeds, then wait until the earliest (and most costly) ones are at the 2- to 3-leaf stage. If both broadleaf and grassy weeds are present, early application to control the broadleaf weeds is recommended. If necessary, spray again to control the grassy weeds, and use a grassy weed herbicide alone or in a tank mix with the HT partner product. Coarse droplets and low water volumes leave lots of untouched area (top half) on this water-sensitive paper.